Rosy "Rosetta" Norman married Stephen Bagwell, son of William O. Bagwell and Mary Catherine Ballard, on 28 February 1904 at Butler County, Missouri. Martha Tummins married Stephen Bagwell, son of William O. Bagwell and Mary Catherine Ballard, on 5 June 1863 at Dickson County, Tennessee. [S1490] United States Federal Census, Washington, District of Columbia, Population Schedule: District 10, Whitfield County, Georgia; Page 681; Dwelling Number: 1197; Family Number: 1196, Date: 1860. Elizabeth Rae was born circa 1824 in South Carolina.1 She married William Bagwell before 1841.1 Elizabeth Rae and William Bagwell lived in 1860 in Whitfield County, Georgia.1 Elizabeth Rae died on 1 April 1878 in Floyd, Georgia. Anderson C. Bagwell was also known as Anderson C. Bagwell. He was born circa 1841 in Greenville County, South Carolina.1,2 He was the son of William Bagwell and Elizabeth Rae.1 Anderson C. Bagwell married Mary Cox on 18 June 1861 at Murray County, Georgia. "A. C. Bagwell" enlisted at Atlanta, Georgia, as a Private in Co. C of the 11th Georgia Infantry regiment (C.S.A.) on 3 July 1861. He was described at the time of enlistment as age 21, eyes blue, hair dark, complexion fair, height 5' 10", born in Greenville District, South Carolina, occupation farmer. He was admitted to Chimberazo Hospital, No. 2, at Richmond, Virginia, on 22 March 1863 suffering from "debility." He was released back to duty on 13 April 1863, and next appears on the rolls wth the rank of 1st Corporal. He served in the regiment for nearly three years before deserting while the regiment was at winter quarters near Morristown, TN, on 23 February 1864. Two days later, Anderson C. Bagwell enlisted in the 12th Tennessee Cavalry, which at the time was stationed to guard the Nashville & Northwestern Railroad in Tennessee. A quiet wedding was celebrated at the toll house, between here and Fall River on Christmas day, the contracting parties being A. C. Bagwell and Mrs. Emma Swan. Only the near relatives of the parties were present and at one o'clock in the afternoon Judge Schooler, in his usual impressive manner pronounced them man and wife. After the ceremony an excellent dinner was served to which those present did ample justice. The bride was formerly a resident of Plumas County and is highly spoken of by those who know her, while the groom is well known for his generous traits and genial disposition, possessed of those peculiar characteristics that make life one round of happy anticipation. [S1491] A. C. Bagwell Grave Stone, Find a Grave, www.findagrave.com. Henderson O'Neal Bagwell was also known as Henderson Onie Bagwell Jr.2 Henderson O'Neal Bagwell was also known as Henderson O. Bagwell.3 He was born on 8 February 1842 in South Carolina.1,4,3,2 He was the son of William Bagwell and Elizabeth Rae.1 Henderson O'Neal enlisted as a private in the 6 Alabama Infantry, Company D.2,5 He was discharged due to disability consequence of an attack of typhoid fever. "I certify that the within named Henderson O. Bagwell, a private in Captain W. L. Gordon's Co., 16th Regt. Alabama Volunteers, born in Greenville District, SC aged nineteen (19) years, five feet ten inches high, fair complexion, hazel eyes, dark hair, and by profession a farmer, was enlisted by W. L. Gordon at Long ? and Alabama on the 25th day of April 1861 to serve for one year and is now entitled to a discharge by reason of disability consequence of an attack of typhoid fever. THe said H.O. Bagwell was last paid by A.P.M. E.H. Harris to include the 31st day of August 1861 and has pay due to him from that time to the present date. There is due to him $29.00 clothing money not drawn. He is indebted to the C.S. on no acc't. whatever. Given in duplicate at Davis Fort, Virginia this January 8th 1862. [S1485] Email from [Name Withheld] dated September 2010 to Hunter Wayne Bagwell - Subject Line: Henderson Onie Bagwell's Descendents. 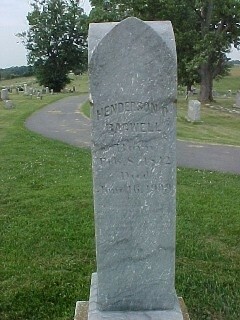 [S1482] Henderson O'Neal Bagwell Grave Stone, Find a Grave, www.findagrave.com. Thomas Jefferson Bagwell was born on 8 December 1847 in South Carolina.1 He was the son of William Bagwell and Elizabeth Rae.1 Thomas Jefferson Bagwell married Aurelia Jane Atwater in 1879 at Mill Creek, Washington County, Kansas. Thomas Jefferson Bagwell died on 17 August 1924 in Cloud County, Kansas, at age 76. He was buried at Pleasant Hill Cemetery, Concordia, Cloud County, Kansas. Milton Joel Bagwell was born circa 1857 in South Carolina.1,2 He was the son of William Bagwell and Elizabeth Rae.1 Milton Joel Bagwell died on 3 December 1970 in Buncombe County, North Carolina. Mary Cox married Anderson C. Bagwell, son of William Bagwell and Elizabeth Rae, on 18 June 1861 at Murray County, Georgia. Glaphrey Nicholas married Anderson C. Bagwell, son of William Bagwell and Elizabeth Rae, circa 1867 at Cloud County, Kansas. [S2099] Edgar Bagwell Grave Stone, Find a Grave, www.findagrave.com. James Thomas Bagwell was born in 1867 in Arkansas. He was the son of Anderson C. Bagwell and Glaphrey Nicholas. James Thomas Bagwell married Della Tyler on 16 March 1906. James Thomas Bagwell died in March 1934 in California. He was buried at Montecito Memorial Park, Colton, San Bernardino County, California. Cynthia Bagwell was born circa 1871 in Kansas. She was the daughter of Anderson C. Bagwell and Glaphrey Nicholas. Zilla Bagwell was born circa 1875 in Kansas. She was the daughter of Anderson C. Bagwell and Glaphrey Nicholas. Zilla Bagwell lived in 1880 in Santa Ana, Los Angeles County, California. Geo. Bagwell died Sunday night after a lingering illness of many weeks. The funeral was held from the Adventist church Tuesday afternoon at two o'clock. Geo. W. Bagwell was born in California, August 18, 1877. On March 11, 1906, he was married to Miss Katie Mieson. To this union eight children were born. He died at Chelan January 11, 1920. He had lived in Chelan for four years. Word has been received of the death of Geraldine B. Bagwell, age 86, of Frederick. A private family burial will be held at the Frederick Memorial Cemetery under the direction of Jackson Funeral Home. Mrs. Bagwell passed away Tuesday, September 3, 2013 at a Lawton Hospital. Geraldine B. Stillson Bagwell was born on October 27, 1926 in Walters, Oklahoma to Warren E. and Laura (Plumbtree) Stillson. She attended Hollister Public School and graduated from Hollister High School in 1944. She was a homemaker and a member of the Hollister Baptist Church. She is survived by one son and daughter-in-law, Bobby and Carol Lynne Bagwell of Frederick; two grandchildren and their spouses, Danna and Curt Akin and Bryan and Tiffany Bagwell; and two great-grandchildren, Lauren and Kirby Akin. [S1495] Susie Mabel Bagwell Grave Stone, Find a Grave, www.findagrave.com. Elizabeth K. Quartermus married William Morrison Bagwell, son of Lorenzo Dow Bagwell and Agnes Elizabeth Morrison, on 17 April 1902 at Martin, North Carolina. Corley Lorenzo Bagwell was born on 3 February 1903 in Kingstown, Cleveland County, North Carolina. He was the son of William Morrison Bagwell and Elizabeth K. Quartermus. Corley Lorenzo Bagwell married Eleanor V. Howell after 1920. Corley Lorenzo Bagwell died on 9 November 1976 in San Diego, California, at age 73. William Morrison Bagwell Jr. was born on 11 October 1905 in North Carolina. He was the son of William Morrison Bagwell and Elizabeth K. Quartermus. William Morrison Bagwell Jr. married Priscilla Emaline Thompson on 19 June 1943 at Skagit, Washington. William Morrison Bagwell Jr. lived on 28 April 1951 in Seattle, Washington. He died on 20 July 1952 in Seattle, King County, Washington, at age 46. Photograph courtesty of Anonymous from Find-A-Grave. 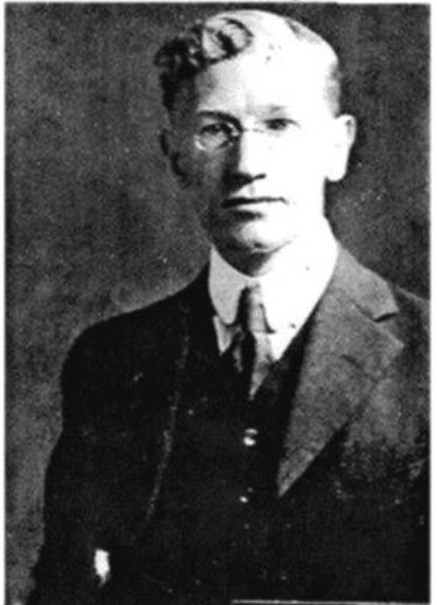 Charles Marvin Bagwell was born on 24 June 1876 in Alexander County, North Carolina. He was the son of William Morrison Bagwell and Alice Rebecca Moore. Charles Marvin Bagwell married Gertude Edna Millard on 12 September 1905 at Martha's Vineyard (Cottage City), Dukes County, Massachusetts. Charles Marvin Bagwell died on 6 July 1944 in Winston-Salem, Forsyth County, North Carolina, at age 68. He was buried at Salem Cemetery, Winston-Salem, Forsyth County, North Carolina. [S2223] Ada Roberta Blackwell Grave Stone, Find a Grave, www.findagrave.com. [S2222] Email from David Bagwell dated May 2012 to Hunter Wayne Bagwell; Subject Line: Richard Stockton Bagwell. Junius Harrison Bagwell was also known as Julius Harrison Bagwell Madeleine Bagwell Perez stated that her father, Charles Warren Bagwell, said they misspelled Junius Harrison Bagwell's name in his obituary (Julius) and on his tombstone (Junious) but he name was Junius.1 He was born on 10 August 1880 in Alexander County, North Carolina. He was the son of William Morrison Bagwell and Alice Rebecca Moore. Junius Harrison Bagwell married Mary Ellen Snider circa 1900. Junius Harrison Bagwell died on 20 June 1946 in Winston-Salem, Forsyth County, North Carolina, at age 65. Madeleine Bagwell Perez stated that her father, Charles Warren Bagwell, said they misspelled Junius Harrison Bagwell's name in his obituary (Julius) and on his tombstone (Junious) but he name was Junius.1 He was buried at Forest Lawn Cemetery, Greensboro, Guilford County, North Carolina. [S2340] Email from Madeleine Bagwell Perez dated August 2013 to Hunter Wayne Bagwell; Subject Line: Charles Warren Bagwell's Ancestors.